Box set containing the three successful crime comedies directed by Steven Soderbergh. 'Ocean's Eleven' (2002) is a remake of the 1960 Rat Pack heist classic, starring George Clooney as Danny Ocean, an ex-convict with a smart new plan to rob the casinos of Las Vegas. Gathering together a crack team - including his old friend Rusty (Brad Pitt) - Danny and the boys begin the meticulous preparations necessary to carry out the complex job, with pickpocket Linus (Matt Damon), con-artist Saul (Carl Reiner) and explosives expert Basher (Don Cheadle) all playing their part. Meanwhile, Danny continues to pursue his ex-wife Tess (Julia Roberts), who is currently dating the casino boss Terry Benedict (Andy Garcia). 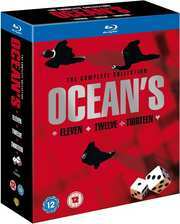 In 'Ocean's Twelve' (2004), it's been three years since Danny Ocean and his crew pulled off one of the most audacious and lucrative heists in history, robbing ruthless entrepreneur Terry Benedict of every dime stored in his inpenetrable Las Vegas vault. After splitting the $160 million take, each of the infamous Ocean's crew have tried to go straight, lay low and live a legitimate life. However, when someone rats them out to Benedict, going straight is no longer an option. He wants his money back - with interest. 'Ocean's Thirteen' (2007) is the third installment in the series. The only hotelier in Las Vegas who can claim that each and every one of his establishments has earned the Royal Review Board's Five Diamond Award, Willy Bank (Al Pacino) has made more than his share of enemies during his impressive ascent. However, in betraying Reuben Tishkoff (Elliott Gould), Bank has finally crossed the one man who could bring his entire empire crumbling to the ground - Danny Ocean. Now Reuben is in a critical condition and Ocean is determined to strike back at the man who nearly murdered his mentor. As the opening of Bank's newest casino draws near, Danny and the crew set into motion a bold plan to humiliate the cocksure casino owner and forever tarnish his spotless reputation.